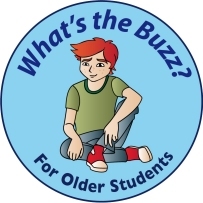 Do you know that we are currently finishing off a new version of What's the Buzz? It will be called, 'What's the Buzz? for OLDER STUDENTS, and will be available early in 2019. In this new edition, Archie has grown up. 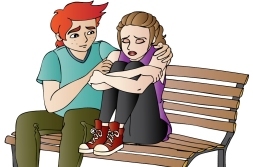 He's about 13 years of age (although we never state his age) and must face the everyday social and emotional challenges that most young teens encounter in their lives. 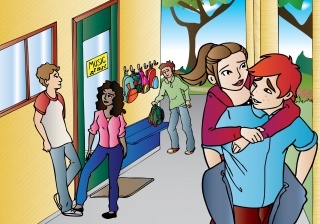 Over 16 lessons young adolescents - perfect for MIDDLE SCHOOL age - are immersed in a variety of age appropriate and challenging interpersonal skills, stimulated by the experiences of Archie. Yes! 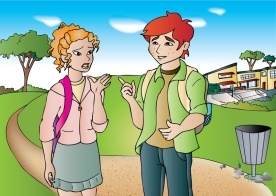 Each lesson begins with an ARCHIE STORY. 'What's the Buzz?' 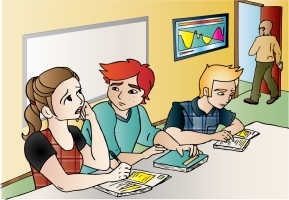 for OLDER STUDENTS is designed to awaken self-awareness, owning responsibility, respectful problem-solving and the development of resilient and resourceful attitudes in young adolescents. The program presents a range of conversations about what really matters as young people experience this important life transition. To give you a taste, here is the likely CONTENTS and one ARCHIE STORY. ARCHIE'S STORY; "Archie, get off your phone! Archie, you're addicted to it!" It was Friday afternoon, school was finished, and school holidays had begun. Archie needed the break. He felt sluggish and heavy; from his tired mind, right through to every exhausted muscle. He hadn't been getting enough sleep and had stopped walking his whippets because he always had schoolwork to do. He missed his old freer life. Early tomorrow morning Archie was flying off with his family for their first overseas holiday. The plan was to be up at 4am and ready for an 8am flight. He felt excited about it, but had planned to stay in touch with his friends through Instagram and Facebook. Both social media platforms, plus YouTube had become important for Archie because he could follow the things he loved and now it was all at his fingertips! Top of his list was music and musicians, some hilarious youtubers, then ninja warrior competitions, the whippets doing flyball at Crufts dog show, drone aerial competitions and amazing drone photos. Archie loved to grab his phone, find a comfy spot and scroll through his favourite feeds. Before he knew it, hours flew by. Social media helped Archie and his friends to stay in touch, swap ideas and amuse themselves. Together, they had set up a group account on Instagram to organise catch ups and share. Friendships were the backbone of his life. Being connected to them kept him feeling that life was good. They held him accountable when his decisions were dodgy, and he did the same for them. Archie's mum didn't understand what it felt like to be part of this new way of being connected to friends and to the world. "Archie, get off your phone! Archie, you're addicted to it!" she'd shout repeatedly. Archie wished she could understand just how important his phone was. He wasn't addicted he just liked it! Lately he'd started taking his phone to bed to check his feeds as he fell asleep, and this is when the unthinkable happened. It was about 9pm and he was in bed to grab a few hours of sleep before a 4am start to catch the plane. As he was scrolling through his feeds a message from Rafi come through. Then another from Tobias, then one from Ayman, then Joanna, Daisy and more from others he knew at school. Archie couldn't believe it. Message after message, photo after photo, about a party they were all at. Archie knew nothing about it. No one had bothered to tell him. Millions of questions raced through his head, like ...'Why wasn't I invited?' ... 'Why didn't someone say something to me?'... 'Don't they realise I can see all this?' ... 'Are they trying to hurt me?' ... 'Are they trying to tell me to get lost?'... 'I'd never do this to them'. Archie felt disappointed, angry and lonely. It left him with so many unanswered questions. All he wanted to do was to respond and let them know how mean they were. But, he didn't do that. He cared too much about his friends to do it. By 1am the messaging had stopped, and Archie drifted into a restless sleep. Even asleep, his mind replayed every happy message and party photo that had been sent between his friends. At 4am, his mother tiptoed into his room and turned on the lamp, "Good morning darling - it's time to get up, get moving and get to the airport." "Go away." Archie grunted from under his pillow. Archie froze. Did he just tell his Mum to 'go away' at the start of a family holiday? He hated what he just said to mum because he knew it hurt her feelings. He didn't mean it. Then, the deeper misery of last night flooded back. He desperately wanted to stay under his quilt.